We present an infant with total anomalous pulmonary venous connection and unusual pattern of drainage from the pulmonary venous confluence [Supplementary video 1 and video 2]. A two-month-old baby was diagnosed with supracardiac type of total anomalous pulmonary venous connection on echocardiogram. Multiple venous channels were noted draining into the innominate vein with multiple sites of obstruction; the origin and drainage site of each was difficult to differentiate on echocardiography [Supplementary video 2]. The baby also had hypoplastic arch of aorta and coarctation of aorta. A computerized tomographic angiogram was done to delineate the anatomy better. All four pulmonary veins formed a confluence [Supplementary video 1] from which a vertical vein originated and branched before draining into the innominate vein, with multiple sites of obstruction [Figure 1] and [Figure 2]. The baby underwent surgical correction of both anomalies simultaneously, but succumbed to a pulmonary hypertensive crisis. Figure 1: Volume-rendered computerized tomographic reconstruction image of the pulmonary venous drainage as viewed from the posterior aspect. All four pulmonary veins form a long narrow confluence. A wide vertical vein arises from it and divides into two branches, one to the left and one to the right; the left branch is narrowed for a reasonable length near its proximal part; the right branch divides again into three sub-branches with narrowing in all. 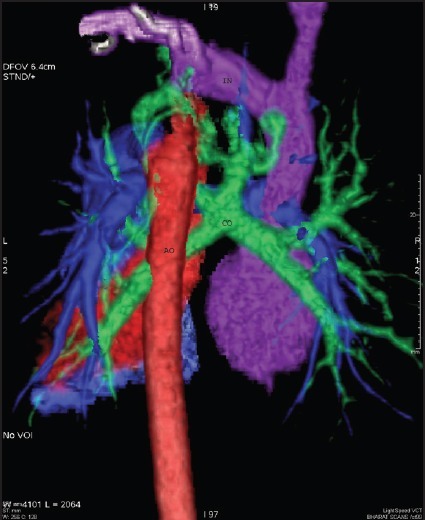 Figure 2: Volume-rendered computerized tomographic reconstruction image of the pulmonary venous drainage and its relationship with other structures, delineated by color coding. The coarcted segment and dilatation of the aorta beyond it can also be seen. AO - aorta, CO- confluence of pulmonary veins, IN - innominate vein. The variability of anatomy of anomalous pulmonary venous connections stems from the interesting embryology of pulmonary veins. The lung buds develop from the foregut and drain into the splanchnic venous system of the embryo. The splanchnic plexus differentiates into the pulmonary venous bed. The common pulmonary vein develops as an outpouching from the primitive left atrium and fuses with the primitive lung vasculature. Total or partial anomalous pulmonary venous connection results if the common pulmonary vein becomes atretic, either totally or partially while connections of the pulmonary part of the splanchnic plexus to the paired common cardinal and umbillico vitelline system of veins are still patent. Usually only one of the connections to systemic veins remains as a vertical vein. Our patient had a vertical vein which showed a branching pattern with obstruction at multiple points. 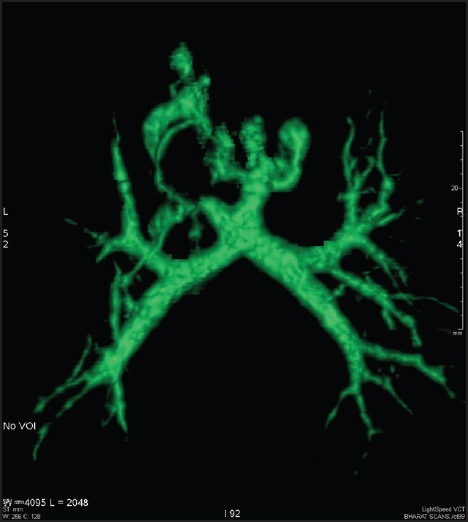 The images [Figure 1] and [Figure 2] are reminiscent of the embryologic connections of the developing pulmonary venous bed to the cardinal system of veins and underline the mechanism of development of anomalous pulmonary venous connections. It is conjectural whether the branching is due to incomplete and differential absorption of the connections of the pulmonary part of the splanchnic plexus to the systemic veins purely as a developmental insult or due to obstruction triggering persistence/formation of multiple channels akin to collateral formation. Obstruction in the supracardiac variety has been reported up to 50%, the most common sites being at the level of left pulmonary artery and at the insertion into the superior vena cava. Bilateral vertical veins with  and without  a confluence, with bilateral obstruction has been reported. To the best of our knowledge, a branching vertical vein with multiple sites of obstruction has not been previously reported. Awareness of this anatomy is helpful in diagnosis and management. From the diagnostic point of view, this case emphasises the importance of having a low threshold for utilizing other noninvasive imaging modalities in addition to echocardiography, whenever atypical features are found. At surgery, the vertical vein is ligated outside the pericardium at the level of the innominate vein. , Preoperative awareness about the complex anatomy of vertical vein will be beneficial for the operating surgeon in dissecting and ligating all the branches. If all branches could not be ligated at surgery, percutaneous closure can be planned electively. 1. Geva T, Van Praagh S. Anomalies of the pulmonary veins. In: Allen HD, Driscoll DJ, Shaddy RE, Feltes TF, editors. Moss and Adams' Heart Disease in infants, children, and adolescents: Including the fetus and young adults, 7 th ed. Philadelphia: Lippincott Williams and Wilkins; 2008. p. 762. 2. Brown VE, De Lange M, Dyar DA, Impastato LW, Shirali GS. Echocardiographic spectrum of supracardiac total anomalous pulmonary venous connection. J Am Soc Echocardiogr 1998;11:289-93. 3. Grosse-Wortmann L, Friedberg MK. Bilateral vertical veins from a common confluence in supracardiac total anomalous pulmonary venous connection. Circulation 2008;118:e103-4. 4. Gavali SA, Phadke MS, Kerkar PG. Supracardiac total anomalous pulmonary venous connection with bilateral (Right and Left) vertical veins and bilateral obstruction. Pediatr Cardiol 2013;34:1751-3. 6. Tweddel JS. The vertical vein: To ligate or not to ligate. J Thorac Cardiovasc Surg 2007;133:1135-6.